The Fellowes Powershred 21Cs Cross-Cut Shredder will shred up to 12 sheets of 70gsm paper at a time into particles measuring 4 x 52mm. This gives the shredder a DIN Level P-3 rating, making it suitable for all your confidential shredding. The 15 litre pull-out bin makes it easy to empty your shredded paper and the shredder will also shred staples, paper clips and credit cards - saving you the time of having to prep your documents before shredding. Other features include: Safesense Technology (which automatically disables the shredder if hands touch the paper entry); the ability to shred continuously for up to 5 minutes (before the machine needs a 30 minute cool down period); a see-through window so you can see when the bin is getting full; a reverse option to help clear any paper jams; an overheat indicator; and a paper entry width of 230mm. Fellowes recommend oiling your shredder each time you empty the waste bin - see Fellowes oil, codes 3505006 (120ml bottle) or 35250 (350ml bottle). 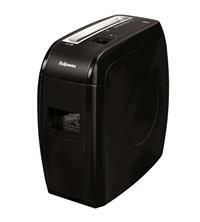 The Fellowes Powershred 21Cs Cross-Cut Shredder comes with a 2 year warranty on the machine and 5 years on the cutters.